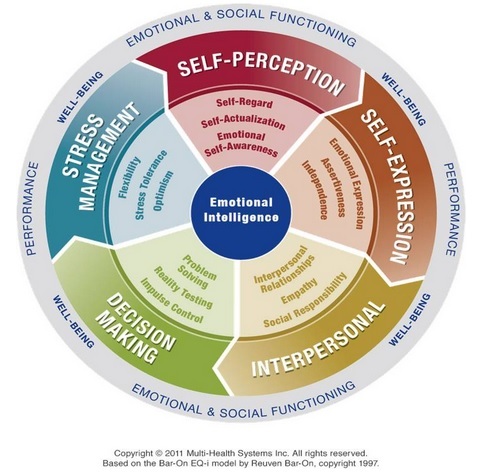 If the EQ-i 2.0® measures an individual’s emotional intelligence, the Emotional Quotient 360® assesses an individual’s performance based on feedback from the individual and their manager, direct reports, peers, family, and friends to result in a comprehensive 360° of emotional and social functioning. The EQ 360® includes the EQ-i 2.0®. Emotional Intelligence is proven to be a key indicator of human performance and development. People higher in EI communicate effectively, form strong relationships, and create powerful coping strategies. EI can be measured—more accessibly and less controversially than IQ—and unlike IQ, it can be substantially strengthened and developed. Just like the Emotional Quotient Inventory 2.0 (EQ-i 2.0®), the EQ 360® relies on the fundamentals of the EQ-i 2.0® Model based on the Bar-On EQ-i® model by Reuven Bar-On. Why use the EQ 360®? Gain insight with rich interpretation and developmental strategies, including sections on balancing emotional intelligence, a well-being indicator, and impact-at-work insights. Get an innovative interpretation tool called the Profile Gap Analysis to identify blind spots, allied strengths, and developmental opportunities. Give the individual the possibility to view both the self-report and rater group results for all fifteen subscales including the Well-Being Indicator. Add up to five custom open-ended questions relevant to organizational goals, situations, and desired outcomes. Allows an unlimited number of raters to provide feedback and provides insights into opportunities for development. Just like the EQ-i 2.0®, the EQ 360® is based on the same rigorous concepts to evaluate when selecting a psychological assessment for use in your organization. Visit the EQ-i 2.0® page to read about the science behind this tool. This multi-rater report is used to gain insight into an individual’s EQ 360® results, with in-depth analysis specific to a workplace context, enabling career and organizational development. It provides focus on the impact of emotional intelligence at work and offers suggestions for working with colleagues, supervisors and clients. This multi-rater report examines results through four key dimensions of leadership (authenticity, coaching, insight and innovation), and compares individuals against top leaders. It helps to view an individual’s scores through a leadership lens, as well as understand how others see the individual as a leader. You would like to get certified?